JOSH ANDERSON: Hello and welcome to your Assistive Technology Update, a weekly dose of information that keeps you up-to-date on the latest developments in the field of technology designed to assist individuals with disabilities and special needs. I’m your host, Josh Anderson, with the INDATA Project at Easter Seals Crossroads in beautiful Indianapolis, Indiana. 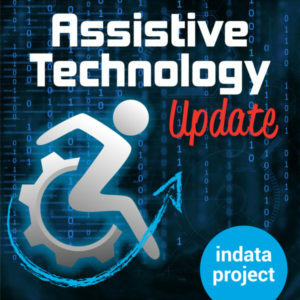 Welcome to episode 387 of Assistive Technology Update. It’s scheduled to be released on October 26, 2018. On today show, we are going to have Doctor Julie Brown, PhD, author of the skill system, to talk about the school system, talk a little bit about mental health and disability, and also the mobile avatar coach, a mobile app she is working on with longtime friend of the show Steve Sutter. Today’s topic and show will deal a lot with mental health, and I know that something that affects a lot of individuals, either individually or they have a loved one that suffers from mental health issues. If you do have someone suffering or you yourself are, it’s very important to be able to go get help you need. In the show notes, we are also going to include the national suicide prevention phone number just because if you are contemplating something like that, you really should reach out. There are people out there that care about you people that will talk to you. So we are going to put that number in the show notes as well as the website. But if you do need that number if you are in crisis, it is 1-800-273-8255. That is the National Suicide Prevention Lifeline. Let’s go ahead and get into our interview with Doctor Brown. Mental health issues can affect us all and present challenges to individuals, families, and the community as a whole. Intervention such as counseling can really help with the challenges, but what about with an individual who has a cognitive impairment or intellectual disability coupled with that mental health challenge? Our guest today is Doctor Julie Brown. She has developed a way to help with the challenges called the skill system. She was nice enough to come on the show and talk to us about it. Welcome to the show. JULIE BROWN:Thanks Josh. Thanks so much for having us. This is such an important issue and I really appreciate your addressing these topics. JOSH ANDERSON: It really is. You see it a lot and then use these days. Everybody always wants to talk about it, but no one really has many solutions. It’s nice to know that people are working on that out there. JULIE BROWN: I think you are breaking up some really important points about how serious these issues are and how few resources we have.Part of it is that the issues are really complex. I think over time, folks have maybe thought of people with intellectual disabilities or cognitive impairments as somehow simpler, when in fact the challenges they face, both in learning strategies as well as the environments they live in, are really very complex. I think it takes a lot of comprehensive application of skills and strategies and procedures to be able to address these problems. JOSH ANDERSON: It definitely does. I want to talk about your skill system a bit, but first could you tell our listeners a little bit about yourself? JULIE BROWN: I’m a social worker, which is really a great application because so many of the folks that we are dealing with live in, like I said, these support environments. It’s important to look systemically at the lives of people with disabilities so we don’t have sideload approaches. We have more integrated approaches. I began writing the skill system way back in the late nineties when I was intensively trained in DBT, Dialectical Behavior Therapy, which is a comprehensive treatment for people with borderline personality disorder that experience high levels of emotional dysregulation. The people with dual diagnoses, and that they had intellectual disability and a mental health problem, often experienced lots of emotional and cognitive and behavioral dysregulation. I went to DBT to try to find solutions. Like you said, there really isn’t anything out there. Fortunately, I found it and fortunately — or unfortunately — it needed to be adapted to improve access to people with intellectual disabilities. JOSH ANDERSON: Very good. Tell me all about the skill system – not all about, but for what we have time for I guess I should say. JULIE BROWN:Okay. In DBT, dialectical behavior therapy, the important part of it is that there is a skills teaching component, because people with really serious behavioral control problems like emotion regulation skills. These folks have deficits in those areas, so in the therapeutic experience, we have to teach skills so people can learn how to self regulate. It breaks them down into four areas for people not without disabilities. So it’s the area of mindfulness, interpersonal effectiveness, emotion regulation, and distress torrents. That’s a great program, but if you have difficulties being able to pull concepts together in the moment, and when people get high emotion that last a really long time, they have a hard time thinking and they can’t bring skill together because of the executive function problems when you have an intellectual disability. So it was really important to be able to take those concepts from these for module is that were taught sequentially. It was important to draw out concepts that were in each one of them that the person would be able to use in the moment that they were experiencing. The sort of cognitive low of the standard DBT modules was just too high. They weren’t able to pull them together. I’ll be perfectly honest with you. Because of the need for co-regulation in these environments, because these people live within supervision, with support staff and family members, that the concepts were actually too complicated for the support staff also, given the amount of time and energy they had to learn. Whatever we use, it has to be very sophisticated to be able to bring in the DBT technology, but also asked be very accessible and user-friendly so that it can be learned and then practiced in the environment with someone with maybe a moderate or mild intellectual disability as well as a family member or support staff. JOSH ANDERSON: Nice. So the skill system is kind of for everyone? It’s not just for a therapist but also perhaps for a parent or caregiver? JULIE BROWN:Exactly. Like I mentioned, from the DBT perspective, these regulation problems happen in transactional relationships. That means we are not just interacting, we are transacting, meaning we are impacting each other and changing each other. If we look at the research around mirror neurons as well as co-regulation, it’s really important, not only for the support system or to remember to be able to coach skills in the moment to help the person with intellectual disabilities to generalize the skills into the environment — because that’s a big problem for them — but it’s also important that the individual self regulates so that they are not kind of bringing dysregulation to the experience. Because when someone lacks emotion regulation skills, they can express a lot of, like I said, sort of cognitive and behavioral issues, but they also have a hard time in relationships. They get very dis-regulated as well. People, when they sort of lose it in support, they have to know what they can do. What the skill system does is it teaches you what you can do at every level of emotion. Because there are things that we can do in high levels of emotion. We just have to stick to those. There are things we should be doing at low levels of emotion, and we need to make sure that we do lots of those. The problem comes in that, when emotions go up, we start doing some of the thing that are necessary to only do when we are calm. So we try to clarify where we are at using the first skill and then how do we decide which sets of skills can reuse given our levels of emotion. JOSH ANDERSON: It sounds like the system can really be adjusted depending on the person’s and need as well as their abilities? JULIE BROWN:Yeah. The goal is to be able to be with yourself and with other people and to be a human being that experiences the full range of emotion. Sometimes, when people think about emotion regulation, that sort of wrongly think about suppressing and always reducing emotion. There are folks that have trouble — they need to actually up-regulate. And some people have problems that they need to sort of down regulate a little more. But the goal is less about suppression and more about being effective where you are and being in tune to what your goals are and being in tune to what strategies can help you reach your goals and be able to be present in the moment and be aware in the moment. That’s a big problem for people to have emotion regulation problems, is that they can live in this tornado experience because their emotions, as I mentioned, with the lack of skill, if they are stressed or calm, they get really upset really fast and it’s really hard to think. What we want to do is get them alert and mindful early inexperience and be able to bring in strategies when they are more calm and focused. Alternatively, what they usually do is this kind of blind sets them. They get really dis-regulated, and then they start desperately trying to bring in strategies that they learned here and there that are not integrated, that are not effective at the high levels of emotion, and they are not sufficient for the intensity as well as the duration that these dis-regulated emotions last four. JOSH ANDERSON: If people want to learn how to use the skill system, what are some different ways they can learn? JULIE BROWN: One way you can learn it is to get emotion regulation skill system book. It’s the Guilford press and Amazon. It’s published as two — there’s one that I self-published in 2011 that has a sun on the cover. I wouldn’t recommend getting that. It’s nice and nostalgic if you’re into the school system. The new version has a blue cover, and that was published by Guilford press in 2016. The really great thing about that version is that when you get the book, you can download the 150 pages of handouts. If you want to copy those and share them with your caseload or with the people around you, you can print them and complete them and share them. Basically the book is about running groups, but you can also teach someone individually the school system. The book is one way. There are trainings. I do trainings. Some other folks may be day trainings. But basically I do three day trainings at different agencies, a couple times a year. I do them in the Boston area. That’s open to the public. That’s kind of a hassle because you have to drive. It’s also just costly to travel and stay and registration. It’s usually $400 or so. It’s a big chunk of time. I’m trying to figure out a way not to have to do those as much, so I’m in the process of developing an e-learning program which I’m really excited about. I’m hoping that people, for a very modest price, will be up to get on and do a school system, probably three or four hours learn the whole system and be able to have people share it with their family members and things like that. I’m working with some of that technology piece and the membership piece to try to get the whole system so people can have access to it for a modest price. JOSH ANDERSON: That would be really nice. Is there any sort of certification or anything involved? JULIE BROWN:Folks, when they start learning, just put energy into learning the model and practicing the model. Once the person feels that they are proficient in the model and are interested — basically the one certification we have is a skills coach. Is not a certification specifically. It’s called a certificate of specialized proficiency as a skills coach. It’s a little different than a certification, because certification implies that is through a separate organization. This is just saying — what you have to do to be a skills coach is that you have to submit a very simple application. You need a recommendation from a supervisor. You need a CV. On the website, there are these free tests that you can take. If you go to the training tab and go to the test center, there are four free tests that you can take that are just way to quiz yourself and see, self monitor where you are in the development of your skills knowledge. You have to take the test and a skills exam. You to pass those with a 90 percent and send me a screenshot. And in the final piece is that you have to do a 45 minute oral exam with me on Skype or resume where I chat with you and code your answers to a series of skills questions. The cost of that is around $250 to cover my time for the exam, basically. That’s a good way and is a five year kind of certificate. If anyone is interested in the skills system, I recommend to go to the website. There are lots of different articles and information about the certificate program. JOSH ANDERSON: What is that website? JULIE BROWN: It’s www.skillssystem.com. The e-learning isn’t there yet. We are sort of mid-production. I’m really hoping that that will be done, I would say in the next six weeks, maybe eight weeks. I think that it will have a very prominent position on the website, so if anyone were to visit, they would clearly be able to see the e-learning. got in the works, a friend of the show, Steve Sutter from Create Ability, contacted us. You guys are working on a mobile avatar coach, an app for phones, tablets, and those kinds of things. I know is not ready yet. I know it’s still in production. You guys are still working on the final thing. But can you tell the idea behind it? JULIE BROWN:Sure. Steve is an amazing person. His dedication to this population is suppressed by no one. I’m so privileged to be his colleague. We’ve worked with a while now trying to get some funding for the project. Despite our efforts, we’ve struggled. But we are both very dedicated to push for the concept of having this avatar on a tablet or a phone, however we are going to do it, that’s going to be interacting with individuals like consumers that have an intellectual disability, potentially with the staff as well, but that basically it will sort of engage with the person to help them walk through their skills. For example, the for skill in the skill system is called clear picture. Clear picture is a set of six what we call clear picture “Do’s,” where we become self aware of the moment, what’s happening inside and outside. Those six things are we knows our breath, we notice our surroundings, we do a body check, we label and write our emotions, we notice the thoughts and we notice urges. To get that sort of check in with the moment so that we can be in the second, not just a moment, but to help people become more aware, the avatar will periodically — either upon request or at specific times — will be available to someone to help them become self-aware, get a clear picture in the moment, and then walk them through the other steps. Wants to figure out this is what’s going on with me right now, where am I in relation, are these thoughts or urges or feelings helping me move in the direction of my goals. And then help people make decisions about sort of their path as they chart ahead, wherever they are, whether they are the home, whether they are in a vocational program or something like that, that we are hoping that, by building in the sort of opportunities to learn these tactics and strategies, especially when people are calm and sort of receptive, that when they are expressing more difficulties, that they will have integrated and learned some of these processes that will help them. Instead of zooming up to high levels, they’ll be able to engage because we will have practiced these strategies over and over again that they will become more ingrained and, instead of blasting off and becoming aggressive or hurting themselves or hurting other people, anything like that, they will have a series of steps that they will have practiced on the avatar to be able to intervene and sort of create a rounded curve on the trajectory of the motion. Also, it creates sort of a means or a vehicle or a tangible experience for the staff member with co-regulation so that — because sometimes training is difficult for staff, and they give very confused. When emotions get going, they are not sure what to do. At the haven’t been there for a long time — it could be a tool that will sort of — it will offer them scaffolding and make it easier for them to be able to intervene in what could be sort of challenging situations. Because some people with intellectual disabilities have expressive and receptive language problems, so this may help to engage people and give them more tools. JOSH ANDERSON: You said it right with the scaffolding, just having that extra piece. When that therapist or the other person isn’t available, having that right in your pocket or at your hands, especially when you do have that stressor. That’s going to be really helpful. JULIE BROWN: I think so. I’m hoping that the visuals — it’s very important that it navigates well, that it is visually the right balance of stimulation as well as not cognitively overloading people. It’s going to take us a while to sort of figure out and pilot to get it to be the right amount of support. I think the right amount of support with the right amount of sensibility built-in so that — it’s got to be flexible. The algorithm is going to have to be carefully constructed. JOSH ANDERSON: For sure. So it could change to each person’s needs. JULIE BROWN: And within each person’s needs, each person’s level and where they are in the moment. It’s got to be very responsive to the changing human experience. At sometimes, the person will be doing this independently and there are times where it will prompt them to talk with staff. The mechanisms in the app have to function for each level of the person’s escalation in emotion. JOSH ANDERSON: I’m sure if anyone can figure it out between you and Steve got you can get it all together. JULIE BROWN: We are surely going to try. JOSH ANDERSON: I know it takes time, especially making something kind of that big. Is there anyway you can tell me a story about someone that’s been helped by this skill system? I’m sure you’ve probably got a ton of them. Maybe just one of your favorites, one that really inspired you or one that you saw a huge change in somebody that was helped by this. JULIE BROWN: I guess that’s an interesting question.One of the things about the skill system is it’s hard to be in the moment when you don’t have emotion regulation skills. When people do learn how to get a clear picture of what’s going on with them and be able to think through situations and make decisions that are on track to their goals and manage their safety, do more where they engage in interesting activities throughout the lives, they learn how to solve problems, which is exciting because a lot of times if he does solve problems and you don’t get to the underlining issues that are making you freak out to start with, learning how to express themselves and getting things that they need and improving their relationship. I think there’s been so many, it’s hard to pick. I guess it’s more about the feeling you get when you are sitting in a group of these folks. Honestly, the discussions that happen are so sophisticated about what people are expressing feeling. I think it’s more insight than I would notice at a dinner party with friends. It’s amazing. When people have the ability and language to talk about these things, because they’re so abstract and they haven’t had a common language, I think that’s what I love about it. When people get a common language, folks with intellectual disabilities are sort of starting for people to understand and to communicate about these intangible and abstract concepts. I really think the furthest thing from the truth is that they don’t understand abstract concepts. I think they do. It’s that we don’t have language and you don’t have people that can understand you and you can’t co-regulate about that and communicate, you’re kind of trapped and buy yourself and get really lonely. I think one of my favorite things is, running these groups, think people come in and it looks like they’ve been prisoners and they’ve been freed. I really encourage people to consider running groups and getting people together to learn like this. It’s really reinforcing for the individual, but it’s also really reinforcing for the people that are trying to help them. It reminds me of Cinderella. It’s a model that the shoe fits for this population. When you start, it’s like, wow, this just fits. When you see that fit, it’s a great thing because we’ve had so few tools that are a fit. JOSH ANDERSON: Trying to fit that square peg in the round hole. JULIE BROWN:Exactly. The hard thing is we have to invest time and money to become really proficient at the skill system. You have to be dedicated. You have to get really good at it because some of these clients are this sort of a black diamond clients that have really complex issues. It’s not just reading the curriculum out of the book that’s going to treat these really complex people. But it’s really the teacher or the instructor has to really dedicate themselves to learning it inside and out so that they can target things and really do teaching that can get into the teachable moment that are so small and variable and moving all over the place. When the teacher get to that level of competency and proficiency, that’s when they’ll see a level of success with the model. But that learning curve is a little bit steep. It takes time. Something I didn’t mention as I do consultation with teams on a monthly basis. That helps them improve their mastery as well. JOSH ANDERSON: If people want to reach out and find out more, do you have any contact information? JULIE BROWN: My email is just jbrown@skillssystem.com. My cell phone is 508-317-2115. Either one of those ways are fine. Like I said, check out the website. There are lots of good articles. Check out the blog. There’s a lot of interesting things going on. I really think that that would be nice. There’s also a simple of the handouts. JOSH ANDERSON: Our guest today has been Doctor Julie Brown, talking about the skill system. Thank you for being on the show. JULIE BROWN: You guys are great. Keep up the excellent work.